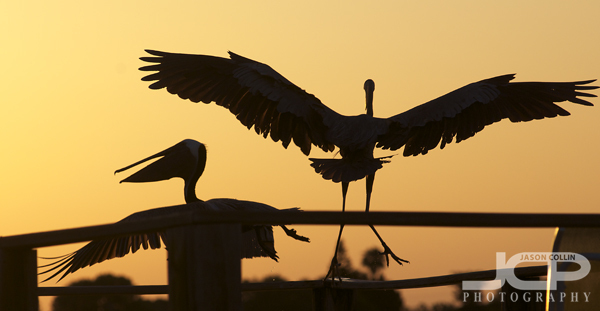 Two of the largest birds in Florida are the brown pelican and the great blue heron. They are a common site around Snell Isle. I have seen both and photographed both many times in the past, but I never caught them in semi-battle with each other. This particular great blue heron often likes to stand on the edge of a small dock nearby. I see him/her on my evening walks with Kiki. This brown pelican too likes to frequent the water around here dive bombing in for a late dinner. Well, this time the pelican was diving too close to the great blue heron and she/he got cranky and the showdown pictured above took place. The pelican was determined to eat, the great blue heron was determined to hold her/his ground. In the end, the pelican moved on and the great blue heron returned to his/her usual stoic stance.